India, in a bid to attract more tourists, decided to liberalise her visa process by introducing India E-Tourist/Business visa in 2015. Tourist can now fill an online form and in 15 minutes get their visa right ? Wrong, instead of making it easier, the process is a total failure with poor implementation often failing to complete payment via an international debit or credit card. But do not worry, This article will provide you with a solution for your India visa payment problem, possibly for less than $10. Some of our customers takes so much of effort to finish the application form and fails to make a successful payment in 3 attempts resulting in getting their application ID blocked and having to re-apply again. If your payment failed, simply fill the form below and we will complete your payment on your behalf. 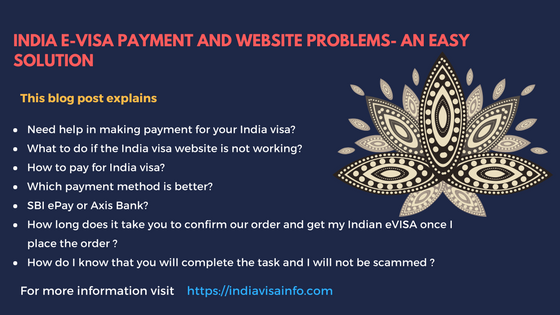 What to do when India visa website is not working ? One needs to have a lot of patience to use the India visa website. It is one of the abysmal and unreliable visa processing systems implemented by a country as important as India. The portal is not implemented properly making it crash almost every time. The website is unable to handle traffic due to the poor maintenance of the servers. One can expect the website to crash/ become unresponsive any moment. Your visa fee depends on your nationality. Your visa fees can be anywhere between £0 to £95. You need to just accept the quote no payment needed yet. What other alternate methods that I can try ? Well, if you have plenty of time still left for your travel . Then we suggest you can wait and make one attempt a day. If you are in a hurry, then you can get someone back in India, then ask them to visit their local SBI branch and complete payment for your India E-Tourist visa Application ID. Or if you would like we can handle this for you. We have our employees in India who will complete payment by visiting a local SBI bank Branch. How to pay for Indian visa application ? Indian Government offers two payment methods. Unfortunately both of these methods are not reliable. You can make use of our dedicated and expert agents to complete your visa application and take care of the entire process for you if you choose to use our service. Which payment method is better for India visa ? SBI ePay or Axis bank ? Axis bank is preferable for European customers because of higher success rate. SBI ePay is better for American citizens. None of them accepts American Express. Therefore you have to use other cards if you have an AMEX. How long does it take you to confirm our order and get my Indian E-VISA once I place the order ? Once you have placed a request on our website to help you process your India E-Tourist visa, we will assign one India visa expert to work on your application. The expert will get in touch with you within 2 hours . Once you have give us all the information needed for us to continue with your visa application, you can expect a confirmation of successful application form our end. Within 2 working days, your visa will be approved and email to you. How do I pay you for India visa application ? You will need to fill in the below given form and pay us Visa fee + $25 . We will start processing your application ASAP. How do I know that I will not be scammed ? We at Indiavisa.com, gives immense importance to user privacy. We do not keep any of your information/card details in any of our servers. You are protected by Paypal buyer protection which enables you to reclaim the money you paid us if you are unhappy with our service via Paypal.